Kate Kenski (Ph.D., University of Pennsylvania) is an Associate Professor in the Department of Communication and School of Government & Public Policy at the University of Arizona. Prior to teaching at the University of Arizona, she was a Senior Analyst at APPC and a member of the National Annenberg Election Survey (NAES) team in 2000 and 2004. She served as a consultant to the NAES in 2008. 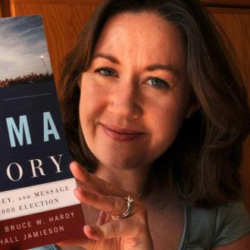 Her book The Obama Victory: How Media, Money, and Message Shaped the 2008 Election (co-authored with Bruce W. Hardy and Kathleen Hall Jamieson; June 2010, Oxford University Press) has won several awards including The PROSE Award for 2010 Best Book in Government & Politics and The 2011 International Communication Association Outstanding Book Award. In September 2012, the book was recognized as one of the top 10 must-reads for election season by the Daily Beast.